We will be featuring slow cooker and easy recipes to get you started for the holiday season! We have 4 slow cookers: a small, regular sized, rice cooker with a slow cooker option, and a pressure cooker with a slow cooker option. And yes, I use all FOUR during the holidays! 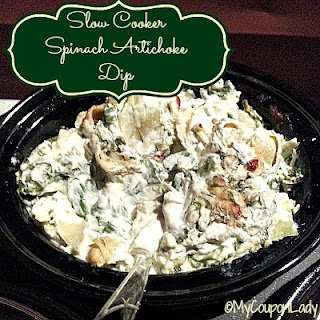 We love this recipe for Slow Cooker Spinach Artichoke Dip from over at MyCouponLady! Fast, easy, and would make a great appetizer!